After having taken the World title in 1980, Alan Jones went back to his home country for a deserved vacation. He did not take it all lying down, his feet kicked up, enjoying a couple of beers. That's a part of Jones' career he didn't pursue fully until one year later. This time he agreed to take part in the 45th Australian Grand Prix, the final round of the Australian Gold Star Championship for F5000 cars. One of the world's longest running events, the Australian Grand Prix would not become part of the World Championship calendar until 1985, when Keke Rosberg won at Adelaide. Before, the event had seen classic venues such as Longford, Lobethal, Bathurst and Phillip Island and lived the high life during the sixties when the Tasman Cup was held to F1 regulations. With Tasman changing the formula to F5000 a new era dawned for Australian open wheeler racing which was about to be closed with this 1980 event. The 45th edition of the race would bide farewell to the five-litre stock block formula as Australia's major single-seater category - already the last one on earth clinging on to the F5000 regulations that were long since abandoned in the UK and the States. Instead it would follow the Atlantic route New Zealand had chosen already in 1975 when F Atlantic became the Tasman formula. This being the end of the F5000 specials, such as the Elfin and the Matich, and with their Aussie hero returning Down Under with the world crown, Australian motorsport mogul Bob Jane had the interesting idea to turn the event into an "international" invitation race, allow F1 cars in and have a party. So the Australian Grand Prix in effect became an F1 race with the local machinery acting as a support act, fighting to decide the national championship. F1 entry was poor, though. In the end just two F1 cars showed up, and three F1 drivers. Jones was there in his title-winning FW07B, Alfa Corse had flown in a pukka Alfa Romeo 179 for Bruno Giacomelli, while Didier Pironi would take on the locals in a home-brew Elfin MR8C. Another disappointment, local favourite John McCormack - the 1977 Gold Star champion - failed to show up in his highly adapted Leyland-engined McLaren M23 because returning from a CanAm adventure with the car he injured himself on the way to the race. Still, this was the middle of November and the thought of F1 cars and drivers racing on Antipodean soil hailed back to the glorious days of the Tasman "Temporada" back in the sixties. For Jones, this would be a celebrational race where a victory was well on the cards. The organizers had passed the goal keeper for him and Jonesy just had to kick the ball into the net. Looking at the opposition - he was set up against the famously unreliable Alfa 179, numerous ageing F5000 designs by Lola and several Australian machines like the 1977-built Elfin, which already stretched the F5000 regulations to its utter limits - we could expect Jones to walk the race, with Giacomelli following suit, still a country mile ahead of the local cars, with Pironi probably outclassing the home boys by a landslide. And that's exactly how it finished. 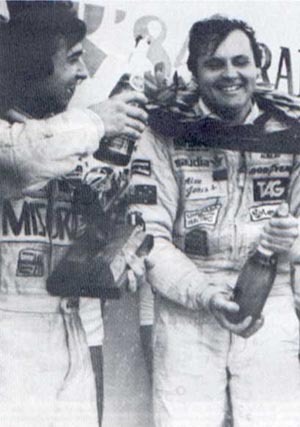 AJ crossed the line first having lapped everybody, including second-place man Bruno Giacomelli, with Pironi third in his Ansett-sponsored Elfin. Then again, the classification table doesn't tell you the story of the race... In fact, it was Bruno's race! So how come he lost it? When the Grand Prix was shot underway on the short and twisty track at Calder Park, at true Mickey Mouse length (1.61km), the field faced 95 laps in gruelling heat. With air temperatures reaching 45 degrees Celsius you were wondering what tarmac temperatures were doing. The Oz drivers had hoped to stand a chance against the F1 cars on the twiddly Calder track, using their torquey Chevies to great effect. In practice they discovered they were blown away by the ground-effect machines, especially losing out under braking. They had to admit the F1 machines were light years ahead. And so Sunday turned into a two-way battle. Jones, starting from pole, took the lead in the same car he used to drive victory in France, Britain and Spain, the FW07-7. He got close attention from Giacomelli, and both immediately started a battle that eventually lasted for 70 laps. On lap 7 Bruno overtook Jones, who had to wait to invert the situation on lap 36. Then, whilst lapping Pironi, who behaved as if he had not seen Giacomelli come up to lap him for the third time, Jones and Giacomelli touched, and Bruno was forced to take avoidance by spinning into the grass. A similar incident had happened on lap 70, when Jones took the lead as a result of Bruno having to make a strange manoeuvre to avoid the constructor of the Elfins, a man with the illustrious name of Gary Cooper. So, as a result of the second incident, Bruno partially damaged his rear tyres, having to slow down considerably as from lap 90, his wheel in a state of pre-desintegration. By lap 94, Jones had lapped him. Meanwhile, Pironi was in a race of his own. At the start he had battled with Italy-born local driver Alfredo Constanzo (here with No.84 seen leading Gary Cooper with No.11), and finally lapped him on lap 25. Bull-fighting his unwilling Chevrolet V8, Didier continued the race to finish third, albeit lapped four times by Alan Jones. Constanzo, driving a Lola-Chevy T430 sponsored by Stock 84 - the local Porsche agent - was finally placed fourth, thus winning the Australian Gold Star Championship, whilst arriving four laps ahead of any of his real competitors. As it was expected, Jones (who started from pole with a time of 36.1s against Bruno's 36.3) set fastest lap of the race, on 36.9s, at an average speed of 157.07 Kmh. Winning the 45th Australian Grand Prix brought back some special memories to the newly-crowned World Champion. 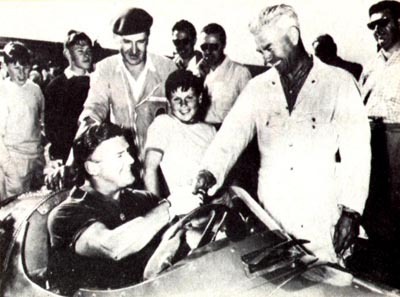 It was back in 1959 that Jones' father, Stanley, won the Australian Grand Prix at Longford, driving a Maserati 250F, after having been crowned Australian Champion in 1958. Of the many aspects to Alan Jones character, a number stood out in particular during his career. There was of course his earthiness which endeared him so much to Frank Williams and Patrick Head, which also saw him treat officialdom with the contempt [he] believed it deserved. 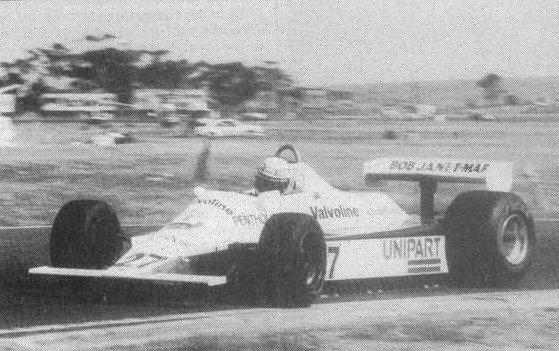 But there was also his patriotism towards his native Australia, and his appreciation for the history of Grand Prix racing, and both of these are brought out in this picture, depicting Jones on his way to victory in the non-championship Australian GP at Calder near Melbourne in 1980. It was a triumphant homecoming for the proud Aussie, with added significance from the fact that his father, Stan, a competitive driver in his day, had won the Australian GP in 1959 at Longford in a Maserati. Funding his own way to Europe in 1970, Jones drove a private Brabham in British F3, and it took until 1973 before he came 2nd in the John Player Championship. This was followed by a season in Formula Atlantic in 1974. 1975 saw the Aussie make his Grand Prix debut for Hesketh, for which he drove four races, before transferring to the Embassy Hill team for four more, including a 5th place result at the Nurburgring to finish 17th overall. In a Surtees for 1976, Jones showed dogged determination (in the words of Autocourse) in recording a 4th and two 5ths on his way to joint 14th with 7 points. But it was for Shadow in 1977 that he held off Niki Lauda to win in Austria in a late-season surge which saw him score 19 points in the last 6 races to come 7th in the title. The switch to Williams in 1978, however, would be the move to put him into the record books. Though reliability problems in the Head-designed FW06 saw Jones only net 11 points, Autocourse rated him the fourth best driver in the world, and in late 1979, when the FW07 began to come good, he reeled off 4 wins in 5 races to come 3rd in the title behind the Ferraris of Jody Scheckter and Gilles Villeneuve. By this stage Autocourse had him as the world's best, and he demonstrated that form in 1980 to sweep to 6 official victories (7 if you include Jarama, about which Jones still whinges) and the championship, with 67 points ahead of Nelson Piquet (54) and Williams sparring partner Carlos Reutemann (42). 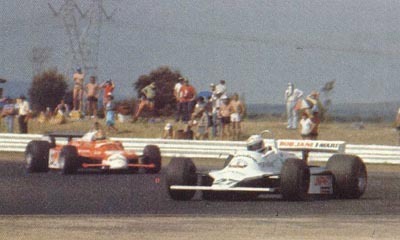 At the end of the year, November to be precise, Jones made the trip down under with his FW07 to compete in the pictured non-championship event at Calder, along with other top F1 drivers such as Bruno Giacomelli. Jones secured backing for this outing especially from local tyre retailer Bob Jane T-Marts, run by former Bathurst winner Bob Jane. 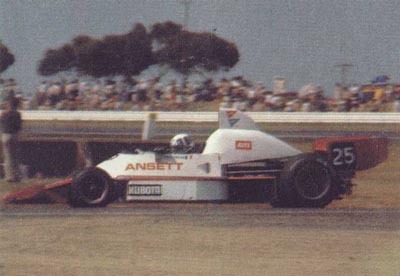 The Australian GP, part of the Formula Pacific Australian Gold Star Championship after the demise of the old Tasman Series, was now one of the very few non-championship races remaining. Future winners, before the AGP achieved World Championship status, included Alain Prost and Roberto Moreno. Meanwhile, Jones recorded only two more wins in 1981 for Williams on his way to third in the title (when 7 points covered the first 5 drivers), before retiring and returning to Australia in 1982 to run a cattle farm (!). 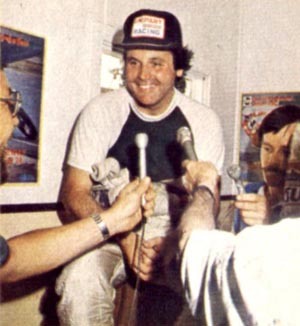 Lured back for a one-off appearance for Arrows in 1983, he retired again before the attraction of Carl Haas cash saw Jonesy return for an unimpressive 20 races in the Team Haas Lola, before his motivation and fitness levels came into question and he decided that enough was enough was enough. Since then he has lived on a staple diet of Australian touring cars, especially the legendary Bathurst 1000, always being doggedly competitive if not always successful. Other pursuits have included watching the progress of rising Australian drivers, including his son Christian, as well as joining the not-so-dulcet tones of the Ferrari-mad Darrell Eastlake in providing studio comments for the Australian F1 audience to supplement Murray and Martin.